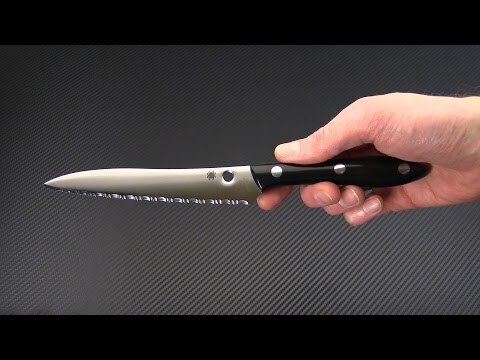 This fully serrated Sypderco Cook's knife is a medium sized utility blade made for the chef in all of us. Made in Seki City Japan, it has the quality you expect from Spyderco and comes amazingly sharp. Brand new directly from Spyderco, Inc.
Blade: Full flat ground serrated blade makes an excellent slicer that can handle small and large cutting chores. Handsome machine satin finish with polished edges gives the knife a high end look. Handle: Made from polished black DuPont Corian and flush mounted with stainless steel rivets. The material is nonporous, heat resistant and easy to clean. The extra weight of the material gives the knife a nice balance yet remains comfortable during use.